ONE) Jim Lee and the return of the red undies to Superman's costume threaten to hog the headlines over Action Comics #1000 - the thousandth issue of the comic that started the superhero game - but check out the all-star creative line-up of this 80-page giant! 'Mr DC' Jose Luis Garcia-Lopez, joins the likes of legendary Superman-artist, Curt Swan, Paul Dini and John Cassaday on pencils, while on the writers' bench we have Brian Michael Bendis' first DC work, Geoff Johns, Dan Jurgens, current Mister Miracle hit-maker, Tom King and more. Now that IS a milestone issue. 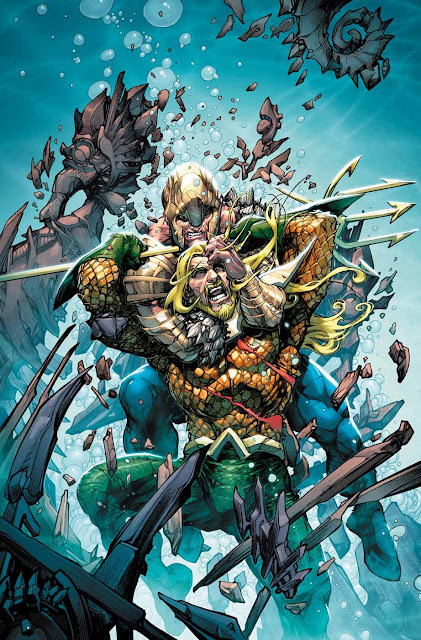 It's not in the list, but this Howard Porter cover for Aquaman #35 is too good not to show off! 2) I wish I could fit the current Deadman miniseries into my pull list - especially as it is drawn and written by Neal Adams, whose prior work on the character still defines him to this day. In Deadman #6 Ra's al Ghul is revealed as the man behind Boston Brand's death, and Deadman's out to even the scales. Time to call Batman. 3) As his body returns to Apokolips to wage war against Darkseid in Mister Miracle #8, Scott's mind remains on earth. Just not literally. All though you never know with this comic... Seriously, this is the best comic I've read in years. See the style other writers will be immitating in 2019 right here. 4) I am sorry to see current Green Arrow writer Ben Percy seemingly replaced in April's #39. One of the only two DC titles I've collected from the 'Rebirth', Ben's Green Arrow has been a progressive, hard-hitting read, making for a brilliant Emerald Archer and an even better Black Canary. Here's hoping writers Collin Kelly and Jackson Lanzing (along with artist Marcio Takara), can reach similar highs. 5. Hal Jordan and the Green Lantern Corps is headed towards #50, and it seems Parallax - if not Sinestro - is returning for the milestone! 'Darkest Before Dawn' kicks off in April, where an evil that the universe isn't ready to face also proves to be an evil that threatens to be too big for Hal Jordan to confront. What're you eyeing up most from DC next April? I'm definitely glad and pleasantly surprised DC decided to bring back the red trunks. Does that mean Batman's blue underoos are too far behind? Wait, so now Neal Adams has decided that Ra's Al Guhl is the real mastermind behind Deadman's death? Yeah, no. I think Neal's recent return trips to old works hasn't been all that good with the unnecessary changes brough tot he material. No. That is a pretty sweet AF Aquaman cover though. No doubt. Porter's clearly evolved from his JLA days, but not in a bad way. Yeah I think Porter and Deodato have just gone from strength to strength since they first jumped onto the scene. Porter's Flash work lately has been ust crazy cool. I think certain deaths in comics should never be solved. I can't remember who said it, but I think it might have been Denny O'Neil, but they said that Batman is stronger not knowing who killed his parents because then he's getting revenge with every punch thrown, because anyone could be the killer. I like that perspective, and think that applies to Deadman as well. Actually with Deadman I'd like him to possess the body of the man who was behind his death, being able to read it in his thoughts, but not be able to see his reflection to know who it actually is. If you could possess your killer, would you return the favour? That's a story I'd like to read. Thanks Dale! Me too Dan, me too, and yeah, and while Deadman never beinig able to discover the identity of his killer is intriguing, even that one wouldn't and couldn't stay a mystery for very long. I can see him recruiting Batman to find out or even ask Rama Krishna, and her eventually telling him when she felt he was able to deal with it without seeking revenge.